The 12,800 level near the February, 2012 intraday high of 12,788 has been a significant support and resistance level back to June, 2011 when it acted as support. Then it was a resistance level in September, 2011. The reversals of roles in an important concept in technical analysis. I want to see a confirmed close around 12,900 that holds for two days before the 12,800 price zone is declared a new support level. The TSX Composite Index has the momentum to breakout above near-term resistance of 12,788 which was the February, 2012 intraday high. But; the materials and oil sectors, which have a 45% weighting in the index, are not participating in the advance. These two sector will have to move upward to sustain the intermediate uptrend in the TSX Index to the 13,500 resistance level. And for these two sectors to move, the underlying commodities have to move upward. But, there is no intermediate uptrend for gold, silver, copper, or oil. And, then there is the frustrating Canadian crude differential partly due to pipeline constraints. And, then there is the low North American price for natural gas. 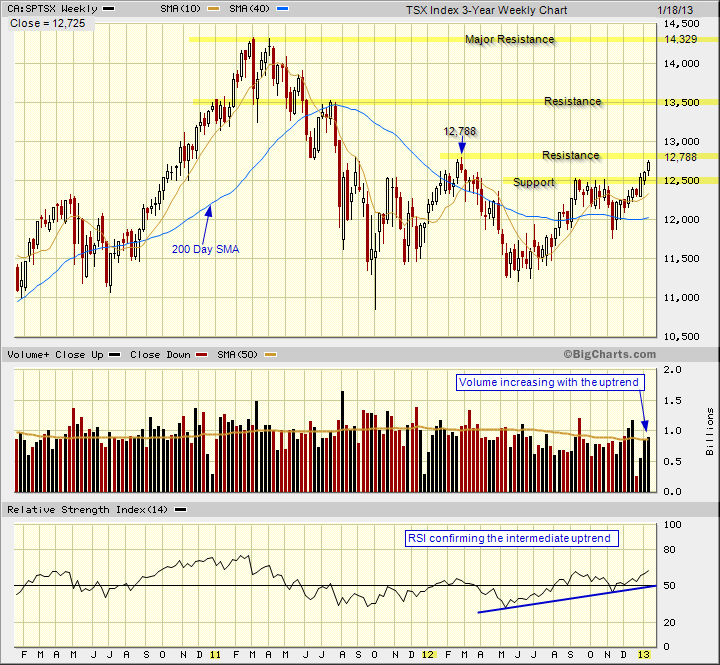 Reference the last chart analysis for the TSX Index posted on January 10, 2013. Note: Click on HOME for updated postings. This technical analysis is for educational purposes so you can learn to trade online using candlestick charts and other technical indicators including volume, moving averages and oscillators. Please conduct your own chart analysis or consult your financial advisor before making investment decisions. The chart snippets are from BigCharts.com which I recommend and have used for fifteen years. The author of this article may hold long or short positions in the featured stock or index. This entry was posted in TSX Index and tagged candlestick chart, chart analysis, intermediate trend, RSI, TSX on January 18, 2013 by Trader.